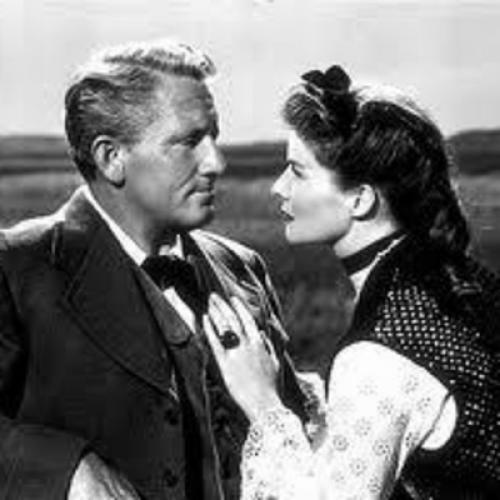 I find my feeling for Spencer Tracy and Katharine Hepburn is a mixture of personal respect and professional regret. I’ve admired them for years, and would still rather watch them than any other team on the screen, but in The Sea of Grass it seems wasteful to let two such good, attractive actors wander through a lavish production like thoroughbred somnambulists. Hepburn of the beautiful bones is more polished than ever; Tracy, though he is no longer a priest—here he is a colonel and what the press has called a Cattle Baron— is still playing Father Tracy and is getting more pensive and solemn and good every day. I think back to when he was just Spencer Tracy and an exciting actor, though I minded his always wearing a gray felt hat, and those days are like a noisy picnic remembered in church. His playing has always been on the quiet side, but now that former underacting seems like a wild romp in the sun. And yet I’m sure there is still fire and magnetism behind his strength. It must be some mistaken actor’s mold he has made for himself (or his reputation), and the story chosen because of it, and the awed direction, that give his performance a static quality. The idea in The Sea of Grass is to show the reaction of a wife’s temperament on the taciturn, solemn character of her older husband. Her warm heart is at variance with his stern principles; his unforgiving nature casts her out of the house, banishes her from her children, and thus ruins both their lives. They make impressive, admirable still pictures every few minutes, but they are about as convincing as waxworks. The one, always fabulously dressed, suffers prettily and, because they are very rich, with ladylike restraint; the other endures in heavy dignity, looking older than Adam. The story may have been a good idea, but it never comes off. There are such great gaps in it that it is hard to understand how it can seem so long. The cattle colonel, always out on the range, worries more about his grass, she thinks, than his decorative wife. She is lonely and bored, and she disagrees with one on his major precepts, which is that homesteaders and farmers moving in on the plains will ruin the cattle business and eventually themselves. She takes advantage of him, in an understandably soft moment when she announces they are to have a baby, to make him consent to giving a piece of his land to some bedraggled farmers. He says at the time that they won’t last six months, and though they go on a bit longer, they suffer every torture of the prairie and end up hating both their benefactors. Tracy tries to keep Hepburn happy by giving her the most entrancingly tender nurse I’ve ever seen (played by Edgar Buchanan), still more clothes and an elaborate party. She dashes around in a cute buggy and flirts with a lawyer, Melvin Douglas. But the scrap over the unhappy farmer folk begins to undermine their marriage and eventually things get so bad that Hepburn lights out. She’s supposed to have come from St. Louis, where she got a charming New England accent, but on this first trip she only gets as far as Denver. There she runs into the lawyer, and they spend what looked to me like a very innocent evening. The producers, Metro-Goldwyn-Mayer, the director Elia Kazan, and the writers, Marguerite Roberts and Vincent Lawrence, then get terribly boy about that evening. She goes home and starts life all over again with her cattle colonel. Then another child, a boy, is born to them. I found out much later he was illegitimate—the lawyer’s issue, no less. It was handled so delicately that it was never made clear to your reviewer. The scenery in Sea of Grass is wonderful and the photography is excellent. Robert Walker and Phyllis Thaxter, as the children, give most creditable performances; Harry Carey as the doctor is Harry Carey. I left the theatre wondering why such a picture was made in such a way. I didn’t believe any of it and I’m a credulous type. No mother separated from her young leaves me cold: that is one-two-three tearjerker stuff, and works in this movie, too. But it’s difficult to put it over when the character has acted like a ninny and deserves what she’s getting. There is no evident reason for a bright woman, with a good heart, getting as petulant or mixed up as this one in The Sea of Grass. She tears up her husband’s check when she leaves for good; she hasn’t a penny; yet she is shown looking as well fed as Hepburn ever locks, and quite modish, and you wonder what she’s doing for a living. The Sea of Grass is a slick super-production and the script must have been as costly as it is slipshod, I still want to see Hepburn and Tracy again. This article originally ran in the March 17, 1947, issue of the magazine.